This is the third medicinal chemistry article, with previous sections focussing on lead compounds as well as providing a general overview of the subject of medicinal chemistry. 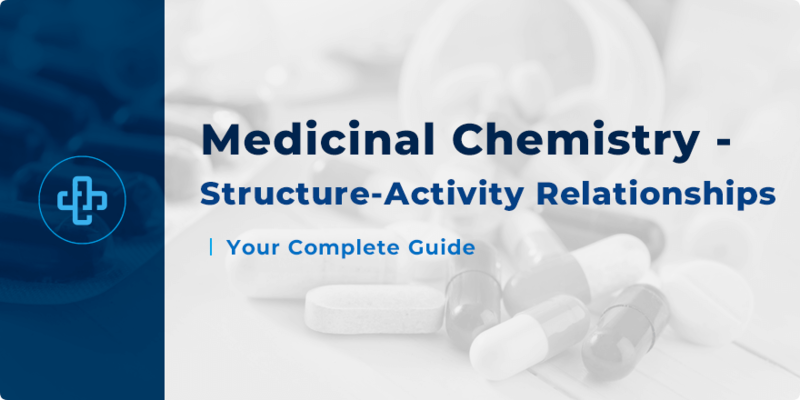 This section takes a step forward in describing in more detail what we mean by structure-activity relationships and how it affects drug design. Possible sources of lead compounds were described in another article. After lead identification, the next stage of drug design involves identifying the structural parts of the lead that are important to its biological activity. Structure-activity relationships (SAR) explore the relationship between a molecule’s biological activity and the three dimensional structure of the molecule. If the target structure is known, computational chemistry and molecular modelling software packages can be useful in identifying binding site interactions. If the target structure is not known, traditional non-computational methods of studying structure-activity relationships are employed. The non-computational method of probing structure-activity relationships will be described. This involves synthesising several structural variants of the lead compound. Structural variants may have functional groups modified or removed. This allows researchers to study how certain structural changes in the lead can affect biological activity. This can also help to identify important functional groups. During SAR studies, biological activity is typically investigated through in vitro tests. Not all of the interactions tabulated above can occur. The results of structure-activity relationship (SAR) studies can provide information on the intermolecular interactions that are actually established at the binding site. Following identification of key interactions, the pharmacophore can be identified. The pharmacophore is a description of the main molecular features necessary for biological activity and their relative positions in space. Armed with the knowledge of key binding site interactions and the pharmacophore, the structural features of lead compounds can be modified accordingly to give desired properties. One may synthesise modified versions of the lead compound in order to reduce side effects, enhance affinity for one receptor over another, and/or improve activity. Medicinal chemists utilise many strategies to introduce structural changes in order to improve a compound’s pharmacodynamic properties. Only four will be outlined below. Modifying the steric bulk or the chain length of alkyl substituents can alter selectivity and/or activity. Isoprenaline is an N-isopropyl derivative of adrenaline. Adrenaline is also known as epinephrine. The compound isoprenaline has greater selectivity for the ß-adrenoceptors over the a-adrenoceptors. The selectivity is attributed to the bulky isopropyl group which can fit in a hydrophobic pocket present in the ß-adrenoceptors. The structural differences between the molecules are highlighted in blue. As mentioned before in an earlier article, lead compounds from natural sources typically have complex chemical structures. Through knowledge of structure-activity relationships, it is possible to identify non-pharmacophoric molecular fragments (ie. the auxophore). Removing complex auxophoric molecular fragments would simplify the lead’s structure. Biological activity is generally retained after simplification, though this is not always the case. Simplification strategies allow for the synthesis of structurally simpler analogues. This was performed in the development of the local anaesthetic, procaine. The lead compound that was used in the development of procaine was the tropane alkaloid, cocaine. Cocaine has been historically used as a local anaesthetic. There is typically free rotation about unhindered single bonds. Bond rotation gives molecules access to many conformations other than the bioactive conformation. Rigidification restricts the conformations molecules can adopt. The rationale behind rigidification is to keep a molecule in its bioactive conformation while eliminating alternative conformations that may interact with other targets. By keeping molecules in a certain conformation, activity may be improved, binding site interactions may be enhanced, and/or side effects could be minimised. Rigidification can be achieved by locking bonds within a ring. Oripavine is an opioid analgesic whose potency is comparable to morphine. The oripavine derivative, etorphine uses an extra ring thereby rigidifying its structure. Etorphine is an analgesic that is several thousand times stronger than morphine. The increased potency of etorphine compared to morphine is due to the combination of improved blood-brain barrier penetration because of greater lipophilicity and enhanced binding site interactions. Etorphine is used in veterinary medicine to immobilise large animals. Etorphine can be derived from another related opiate alkaloid, thebaine. Thebaine is structurally similar to other opiate alkaloids but possesses no analgesic activity. Like oripavine, thebaine contains a diene. For simplicity, other reaction details have been omitted. A ketone and the extra ring are introduced through a Diels-Alder reaction with 3-buten-2-one. The resulting compound is more rigid than thebaine due to the extra ring. Various groups can be delivered to the ketone through a Grignard reaction in a stereospecific fashion. A similar approach was done in the next example. Free rotation can also be restricted by using conformational blockers. The rationally designed tyrosine kinase inhibitor, imatinib uses a conformational blocker. 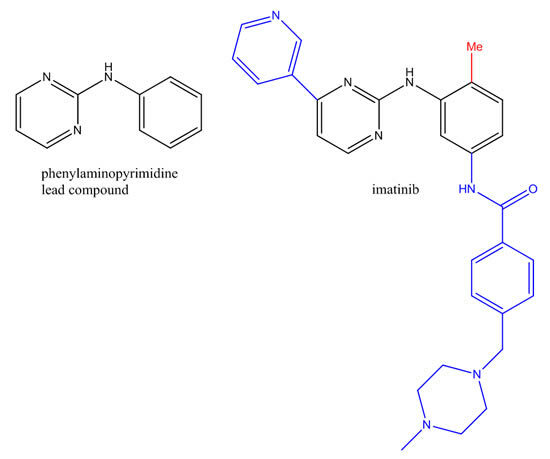 The lead compound of imatinib was identified from the screening of chemical libraries. Imatinib uses a methyl group in the ortho position as a conformational blocker (highlighted in red). This hinders rotation about the aryl-N bond. The pyridine-pyrimidine rings are oriented away from the methyl conformational blocker. The use of the conformational blocker is thought to be responsible for enhanced tyrosine kinase activity. Imatinib is employed to treat multiple cancers, but most notably Ph+ chronic myelogenous leukemia (CML). Nature Reviews Drug Discovery, 2002, 1, pp 493-502. This concludes the article on structure-activity relationships. Analogues may be synthesised in such a way that they fulfil the pharmacophoric requirements and have optimised binding site interactions. However, these analogues may have poor pharmacokinetic profiles. Further structural modifications may be needed in order to rectify the problem of poor pharmacokinetic properties. Solutions to these problems will be the focus of the next article. The next article will also introduce the concepts of prodrugs and bioisosterism.